“I got the inspiration for a road trip from my friend, Kenneth Mosher, who did an eight month trip for $8K. He went across the United States. He even bought a plane ticket and backpacked in Hawaii for two weeks. He was a friend, not just a random friend, but one I knew intimately from high school. We just kept bumping into each other over the years. I thought if he could do it, then I could. I knew I asked him questions. He believed I could do it,” Amanda said. “Kenneth called me one day when I was on a break at work. I told him I was at corporate. He said he expected me to end up there. We kept exchanging stories. I felt like I had a preview into the rest of my life already. It wasn’t horrible, but I knew if I kept doing this my whole life, I’d regret it,” Amanda said. “He said he did this and we had a conversation about it. There was never one trigger. He gave me the spark. I just thought I wasn’t that type of person. I didn’t think I was very adventurous, but I wanted to be. If you’re scared to do new things, what do you do? You just try new things,” Amanda said. Amanda had a savings goal. Three months was her stretch. She still had student loans, a car payment, and a phone bill. She didn’t wait until all her bills were paid. “This trip totally, totally intimidated me. I’m not adventurous, but I’d like to be, and this kind of attitude totally changes it. I decided that I wanted to talk myself into it more than talk myself out of it. Around October I started getting it in my mind that I wanted to leave around June. It ended up being May. I started selling my furniture. I made a series of small decisions. I quit my job. I couldn’t turn back. I kept moving forward. At a certain point, you can’t back out,” Amanda said. “I read The Alchemist before my road trip. A friend recommended it. She told me it was about someone who pursued their dream and found it. When I came across it at a bookstore in the airport, I got it. This was the perfect book to read before my road trip,” Amanda said. “Some people just don’t take the opportunity because they don’t think they’re the type to do it. Some people label themselves. I could tell myself I’m not well traveled. I’m alone. Some people will tell you when you move you need your next job lined up. Or you tell yourself you won’t travel until you have a friend or a partner who wants to go with you. And don’t forget the biggest one. Solo travel for a woman, you can’t do that! It’s not safe,” Amanda said. “These are preconceived notions and labels. I needed someone who shattered that mold. For me it was Kenneth,” Amanda said. “People write themselves out of the equation. I thought some people just had it in their heart. You might think that just other people do this. I just want to inspire you to go,” Amanda said. You need a forerunner for things in life and sometimes you’re the forerunner. “If you want to do it, there’s an ideal time. I had a friend who told me he was moving from Ft. Myers to San Diego. At first he told me about all his furniture and how he spent a lot of money on it. It turns out it’s just as expensive to move all the furniture, so you might as well sell it. After we talked about it, he decided to sell his stuff and make a two-week road trip out of it. You have to be prepared to let a lot of things go,” Amanda said. Amanda Haataia sold virtually everything she owned, quit her job, and started trekking solo across the United States in her Scion. She didn’t consider herself adventurous until she embarked on this road trip. “One of the highlights was at the Wildflower Cafe in Gardner, Colorado. I met a family and helped them wrangle in their horse. There were four generations from the great grandparents to the grandkids. This family left me the keys to their house. Something like this doesn’t fall in your lap when you’re sitting at home,” Amanda said. Young boy Amanda met on her road trip. 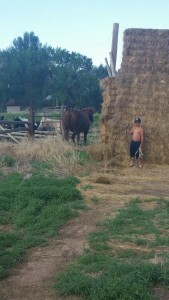 She helped the family wrangle in their horses. “You never know how something holds you back until you let go of it. If you hold on to anything, everything has its price. You know its value in a good way. But then you start to understand your true value. Until you exercise your freedom, you don’t know you have it until you experiment and try it out,” Amanda said. Your furniture can hold you back. I didn’t value freedom until I took this road trip. I used to think I was free when I could have dessert before dinner and that was my definition of freedom. “Another thing about Kenneth, is that he’s totally different now. A lot of his friends say he’s way better. And these are people who already thought highly of him. Sometimes we want to be better people, but if you’re always in the same environment, you’re not putting yourself to the test to see new values, or even have the desire to find yourself. Once you have the freedom to be however you want to be, you can craft yourself to be who you’re meant to be,” Amanda said. This is a story of finding yourself. “I knew I didn’t love my job. I also didn’t think I needed to love it. I picked all the logical things for a new job, but I knew I didn’t have enough information to know what I wanted to do. I felt I would get into another job, and it would be just the same. I felt I hadn’t lived enough. I came across a lot of other people who felt the same way and quit their job. I wouldn’t say I was adventurous until this road trip,” Amanda said. You have the time to read the books and play out the things you care about. Most things you find out that don’t matter as much as you thought. Some things fade into the background and then other things stand out. If you don’t know what you want, what are you going to chase after? “Sometimes it seems like a lot of hype about big cities. You can read blogs or read about places, but once you experience cities for their culture, climate, and price tag, then you can say I like this culture or this temperature during the day,” Amanda said. “I loved Colorado Springs way more than Denver, but everyone hears about Denver. I realize I can get all of Denver for half the price in Colorado Springs. I started to realize how much outdoorsy stuff I like,” Amanda said. 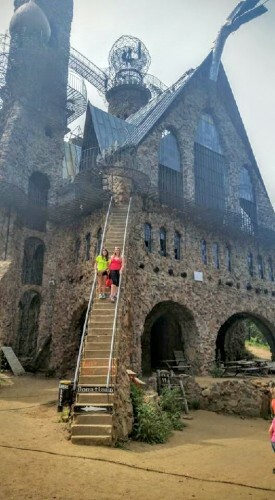 “Jim Bishop’s Castle was an amazing part of my road trip! I loved visiting with the first best friend of my life, April Amaya, my friend since I was six years old,” Amanda said. “You start to play with your values, rather than sitting behind a desk. You get all of that without living in one city for five years. You get a preview and taste of everything. Now when I approach my job search, I’ll know more about what I want to do, and some of the tradeoffs of each city. It’s way way better than what you could ever read,” Amanda said. “I just want to inspire people to take road trips. You have to decide that you want to do it enough. You’ll discover on your own what matters and what doesn’t and it will be totally different from mine,” Amanda said. I went to Wye Campground in Colorado Springs. I was away from everything. From my tent I could see the Milky Way. It was a great experience. I went uphill for about an hour. I met some people in a group of five or six people. They had to drop off 2-3 people at airports because they couldn’t handle it. When you go out, you learn what you can handle. “I had a myriad of experiences. Every day was new. Even if I had a bad day, there was always tomorrow which was so different.” Amanda said. You realize the extent of flexing your freedom muscles. That’s what a road trip does. You don’t realize how free you can be until you test it. It’s a change in thinking. It isn’t always the experiences. It’s more about the things I was thinking, knowing I can do it. 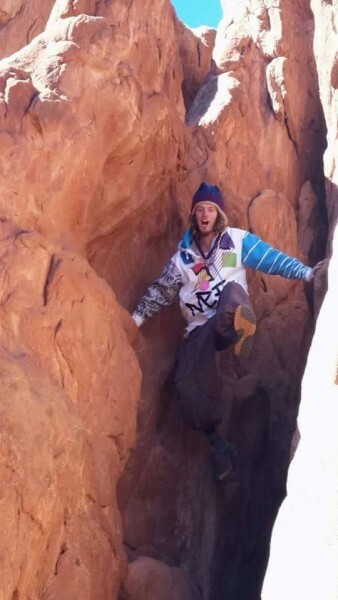 “I had a lot of first times on this trip: couch surfing, going to a drive thru movie in Pueblo, Colorado. Wait, oh yeah, it’s called a drive in. I had a few times when I woke up and didn’t know where I was going to sleep that night for the first time. I wasn’t worried about it. It was the first time in Louisiana, first time in this state, first time trying new food. It was the first time I did a thirteen hour drive in one day. This was how long it took from Dallas to getting into Colorado. I just had to get to Colorado. Every day was a first for something,” Amanda said. “My sense of adventure has gone up. I met a lot of people. Some of the people who hosted me are some of the most open-minded people. That’s why they get involved in couch-surfing,” Amanda said. “On the road I read the amount that I’d like to, whereas before I couldn’t find the time to read. I flossed pretty much every night on the road. I met my goal to not use heat tools on my hair. Now I can go days without makeup and without caring about it,” Amanda said. My concern for what other people think about me has gone down. I don’t care in a good way, a positive way. I know which advice to ignore and listen to now. Any time I come to a decision I get practical advice. I listen to my heart. On a road trip like this you wake up in a new day and you have three or four choices. You don’t feel obliged to go with your friend. You have a chance to go with yourself and not be ashamed of it. 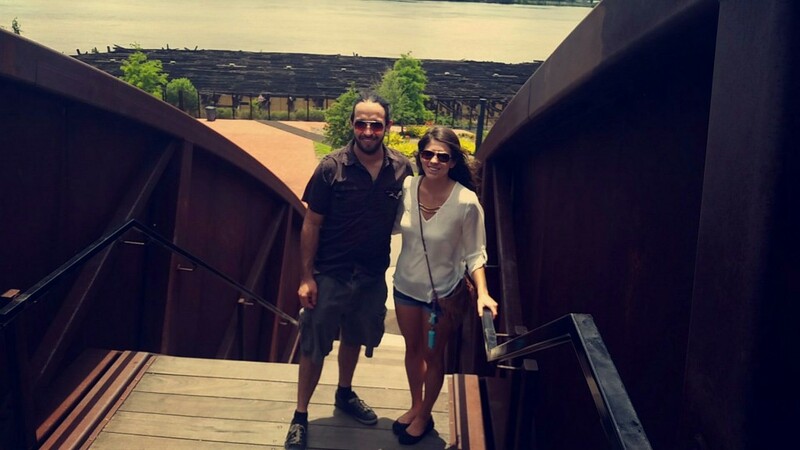 “My first Couchsurfing experience was in Pensacola Beach. I texted them just before I arrived. My heart was racing. I told myself if I don’t feel safe, I’ll leave. I knew I could get a hotel. There were about five cars in front of the house. Someone was outside and offered to help me with my things. I told him I’d get my bag later. I asked for Alex. He told me I was at the right place,” Amanda said. “I grabbed my purse and locked my car. I knocked on the door and there were about seven people inside. I wondered what I got myself into. It took me a while to get comfortable with all of them asking me where I’m from, where I’m going, how old I am, how far I am into my travels, and more and more questions. It was a house with four lifeguards. Apparently Pensacola Beach is not a safe place for surfing,” Amanda said. If you don’t have the time to travel, you can be a host to Couchsurfers from all over the world. You can also be picky with who you want to stay there and just accept people from other countries to learn about them. Hosts can choose who they want. If they don’t want to have someone that night, they just decline the request. You arrive and request a day or two, or possibly more. You just see how your vibe is, and how you click. Then you can see if you want to stay for a day or a week. “One time I put in a request for a day and stayed for four. I stayed three days in New Orleans. I did two different Couchsurfing stays in Houston, two nights each. One of the guys I met in New Orleans loved to cook. He cooked for me twice a day.He was from Honduras. His dad left the family and his mom had arthritis. He grew up cooking to help take care of the family.” Amanda said. His dad left the family and his mom had arthritis. This man from Honduras learned to cook for his family at a young age. “Once you get used to it, it gets easier. As I got more into my road trip, I felt more independent. I felt more comfortable on the road. I met travelers and would just crash with them. Couchsurfing it’s totally free,” Amanda said. Couchsurfing is just a network to help you get comfortable with it. After a while you don’t need it, but at first it gives you references and you feel safer. When you sign up you fill out your about me page, your philosophy, how you participate, what music, movies or books you like, your age, occupation, current location, stuff like that. If you’re a host, you say if you have a shared room or private bedroom, how many surfers can you have. You explain parking at the location, or things to do in the area. The more detailed you are, the more trustworthy you seem. And you can add photos too. At the end of a stay you answer a few questions about your visit and what it was like. And you can leave a reference. Then you can read what others said about a host or visitor. Cleverness can be learned, but does not get you far like true experiences can. I’d love to learn deeper truths about generosity, community and understanding. “I downloaded Airbnb before my road trip, but I didn’t use it. Even if it’s $20 or $40 to stay somewhere, I valued each day so much that I didn’t want to spend this much. I called Kenneth twice along the way when I ran into something and I didn’t want to ask Reddit. He told me how he found free campsites. Free Campsites was a helpful site. I also used Hostelworld,” Amanda said. During this road trip Amanda met a lot of new friends along the way. Here are a few people she met at a hostel. 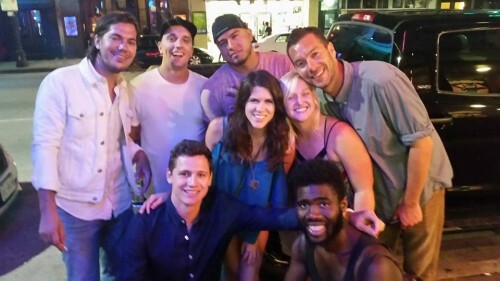 They snapped a photo together at 6th Street in Austin, Texas. “I liked staying at Drifter Jack’s Hostel in Austin, Texas. It’s a lot of solo travelers who come together. Everyone is very inviting. Everyone met around the pool table around 10 or 11 in the morning and evening and everyone would go out together. No one knows each other so everyone’s invited. They’re all cool people,” Amanda said. 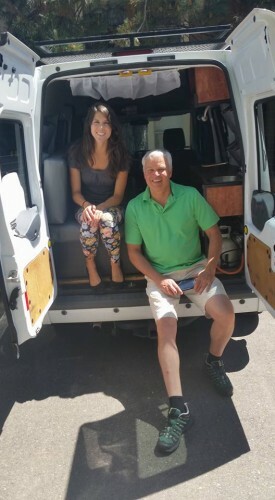 “This fellow roadtripper I met in Englewood, Colorado, put my ride to shame! His van had a bed, sink and stove! After losing to pool, I was able to whup his son in Catan,” Amanda said. “I used Podcast Addict for entertainment on the road. I also downloaded the AllTrails app because I wanted to go hiking,” Amanda said. “I used Reddit and some of the Subreddits. Its fun to play with. They have a community for everything. I subscribed to some Subreddits such as r/vandwellers, r/solotravel, r/roadtrip, r/nationalpark and r/travel. The content is invaluable. These were so helpful. If I didn’t know the answer, I would go to a community of people who cared about it,” Amanda said. “You can ask a question like, ‘how did you eat breakfast on the road.’ And someone will answer. ‘If I wanted to have cereal, I’d buy small containers of almond milk.’ Someone told me to get a memory foam pad. This made camping even a little luxurious. It was helpful finding these communities,” Amanda said. If you’re looking to talk yourself into something instead of out of it, go to the people who believe in it to get the answers you want. This is how to make something a reality. “But even a positive story has its baggage. Do you want to know some of the negatives of the road trip? It would be different for everyone. I even look at them almost positive now. There’s travel stress for sure. There are some days you feel like you should be doing more. You have this expectation when you travel that you should be doing this grandeur thing every day. I’m in this new city and just playing a board game and having a beer with someone while couch surfing. And then another day you just do laundry. You think about adventure, but it’s not 24/7. It’s really tame in a way,” Amanda said. Nothing prepares you like the road trip itself. I was in a job I didn’t love. I wanted to do a road trip and I wanted to get the information to believe I could do it. If you just want it a little bit, that’s all you really need. Then you realize this applies to everything in life. As long as you’re going down some road. This road trip gave me so many avenues to go down. “Shutting down chapters can be sad. I cried several times on the trip and I’m ok with this. I lost my Kindle . I was bored with some of the people I met. The good part is that it was only a day. It’s not an entire life. You have bad days on a road trip, but you don’t feel stuck or attached to that day. If you have a bad day at work it can stick in your head, like this is my life. It’s going to be like this for ten or twenty years,” Amanda said. “It’s easy to let it go because you can play with your priorities, but you have to experience some bad things to know. After a while with podcasts, I got annoyed with how political they were. I got lonely, but not as lonely as I thought. In fact, sometimes I got overwhelmed with meeting so many people. Pretty much everyone asks the same ten questions. Where are you going? When did you start? Where are you from? How old are you? You get used to it, but telling the same story while traveling gets exhausting. By the 47th person, it’s boring,” Amanda said. “On this road trip, I realized how much I want a horse and dogs and cats,” Amanda said. The benefits are beyond the road trip. You have no idea the extent of what you can do when you’re stuck in a routine. Don’t get me wrong, I love my routines and good habits. You don’t realize how many things you put around your head until you go out and do a road trip. Then I realized I can take this liberation with me wherever I am. 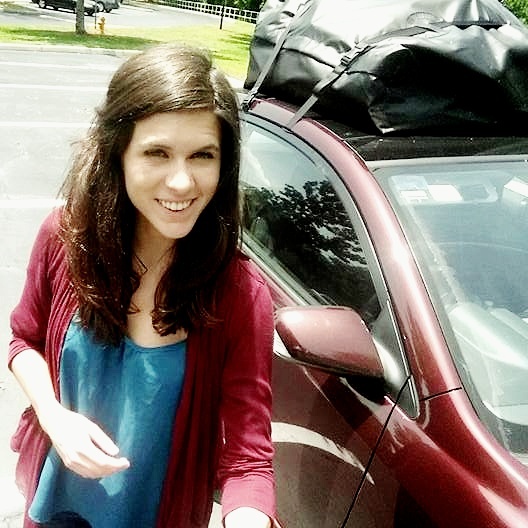 “Yes, this road trip changed my life,” Amanda said. If you’re feeling sluggish with your life, a road trip might be the reboot you need to start over. Amanda Haataia loves listening to music, watching movies and reading books. 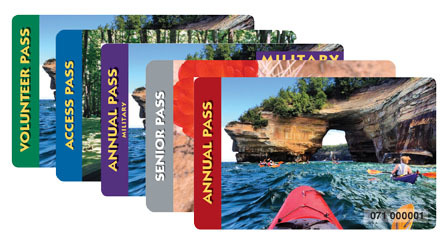 She enjoys the outdoors and is a card-carrying member of a National Parks and Federal Recreational Lands Pass. She recently sold virtually everything she owned and started trekking across the country in her Scion topped with an unlocked cargo bag. In addition to traveling across the United States twice (once with family in 2005, and this trip in 2016), Amanda has also traveled to Canada, France, Ireland, Mexico, Spain and Switzerland.